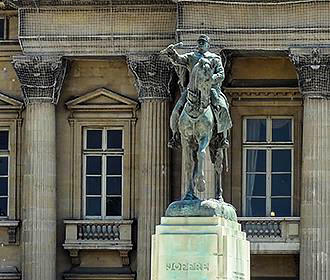 Located in between the Ecole Militaire and the Champ de Mars Park, the Place Joffre is a small square dedicated to a gentleman that became a Marshal of France and it has an equestrian statue of him located outside the military School of War. Joseph Jacques Cesaire Joffre, often known just as Jacques Joffre, was a French General during World War I. He is most well known for regrouping the retreating allied armies in order to defeat the Germans at the strategically decisive First Battle of the Marne, which happened in 1914. And with this triumph, plus other strategies that Joffre put in place, he gained further popularity and became referred to with a nickname of Papa Joffre. Because of these triumphs, even before World War I had ended, Josephe Joffre had been awarded the title of Marshal of France, or in French this would be Marachel de France, and he was the first person to receive this title and rank under the Third Republic, even though he also received other honours including knighthood. Now as you have probably gathered by now, the Place Joffre was named in his honour, and even though World War II was imminent, an equestrian statue was also produced at the same time for the inauguration in 1939. The statue of Joffre is also recognised as a monument in Paris, and this was produced by Maxime Real del Sarte in 1939, who was a French sculptor that produced many different works of art in Paris and in other areas of France. And you will find this is a bronze equestrian statue depicting Joseph Joffre wearing a long coat, riding his horse, and the horse has, like many equestrian poses, its front foot raised, and is positioned looking onto the Champ de Mars Park with the front facade of the Ecole Militaire behind him. Considering its location between the Ecole Militaire and the Champ de Mars Park, the Place Joffre and the equestrian statue of Joffre is very easy to get to as it separates the two between the l'Avenue Duquesne and the l'Avenue de La Bourdonnais on one part and the l'Avenue de Suffren, and the Carrefour General-Jacques-Paris-de-Bollardiere on the other. And located in the 7th Arrondissement, when it comes to public transport in Paris, the nearest Metro station called the Ecole Militaire stop via line 8 is the best option, or in the opposite direction is the La Motte-Picquet - Grenelle stop via lines 6, 8 and 10. However, you also have the Champ de Mars - Tour Eiffel stop for the RER trains via line C, and by this is the Bir-Hakeim Metro station serving line 6. Yet there are also the bus numbers 28, 80, 87 and 92 that will get you close by to the Place Joffre, as will the bus tours in Paris such as l’OpenTour and Les Car Rouges. In addition to this, the Batobus water bus also has a stop at the foot of the Eiffel Tower by the Pont d’Iena bridge over the River Seine.